Tension-type headache (TTH) imposes a heavy burden on the global population but remains incompletely understood and poorly managed. This is the most common type of primary headache: its lifetime prevalence in the general population ranges in different studies from 30 to 78%. At the same time, it is the least studied of the primary headache disorders, despite the fact that it has the highest socio-economic impact. Tension-type headache is a neurological disorder characterized by a predisposition of attacks from mild to moderate headache with few associated symptoms that you can find in the subtitle ‘Characteristics’ (2). 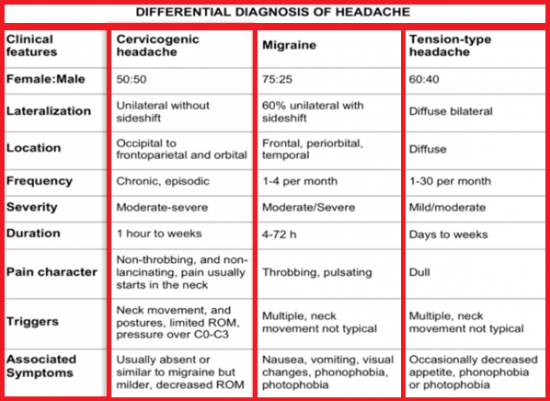 The criteria for tension-type headache are based on the IHS classification. They are mentioned in the subtitle ‘Diagnostic Procedures’. 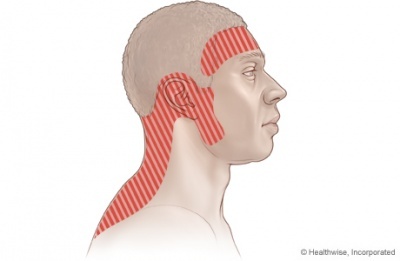 Some tension type headaches could be classified only as probable tension-type headache. The brain itself is insensitive to pain, so that is not what hurts when a headache arises. - The tissues covering the brain. - The attaching structures at the base of the brain. 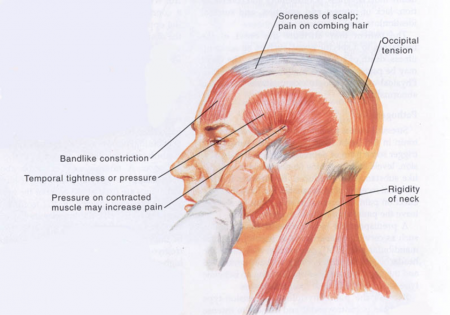 - Muscles and blood vessels around the scalp, face, and neck. The pain is commonly described as a tight feeling, as if the head were in a vise. It usually occurs on both sides of the head and is often experienced in the forehead, in the back of the head and neck, or in both regions. Soreness in the shoulders or neck is common. The muscles who are tight in the frontal and temporal regio are: the masseter, pterygoid, sternocleidomastoid, splenius and trapezius muscles. - The pain is of mild-to-moderate intensity and is steady, not throbbing or pulsating. - The headache is not accompanied by nausea or vomiting. - The pain is not worsened by routine physical activity (climbing stairs, walking). - Some patients may have either sensitivity to light or sensitivity to noise, but not both. The causes of tension-type headache are still uncertain. Although tension-type headaches were once thought to be primarily due to muscle contractions, this theory has largely been discounted. Instead, researchers think that tension-type headaches occur due to an interaction of different factors that involve pain sensitivity and perception, as well as the role of brain chemicals (neurotransmitters). Genetic factors are likely be involved in chronic tension-type headache, whereas environmental factors (physical and psychological stress) may play a role in the physiologic processes involved with episodic tension-type headache. Research indicates that patients with tension-type headache may have abnormalities in the central nervous system, which includes the nerves in the brain and spine, that increase their sensitivity to pain. Neurotransmitters are chemical messengers in the brain. Several types of neurotransmitters have been identified as playing a role in increasing activity in pain pathways in the brain and affecting how the brain reacts to pain stimulation. In particular, serotonin (also called 5-HT) and nitric oxide are thought to be involved in these chemical changes. Release of these chemicals may activate nerve pathways in the brain, muscles, or elsewhere and increase pain. Infrequent episodes of headache lasting minutes to days. The pain is typically bilateral, pressing or tightening in quality and of mild to moderate intensity, and it does not worsen with routine physical activity. There is no nausea but photophobia or phonophobia may be present. Frequent episodes of headache lasting minutes to days. The pain is typically bilateral, pressing or tightening in quality and of mild to moderate intensity, and it does not worsen with routine physical activity. There is no nausea but photophobia or phonophobia may be present. Frequent tension-type headache often coexists with migraine without aura. Coexisting tension-type headache in migraineurs should preferably be identified by a diagnostic headache diary. The treatment of migraine differs considerably from that of tension-type headache and it is important to educate patients to differentiate between these types of headaches in order to select the right treatment and to prevent medication-overuse headache. A disorder evolving from episodic tension-type headache, with daily or very frequent episodes of headache lasting minutes to days. The pain is typically bilateral, pressing or tightening in quality and of mild to moderate intensity, and it does not worsen with routine physical activity. There may be mild nausea, photophobia or phonophobia. - Medication-overuse headache: History of previous primary headache. Use of analgesics and ergotamine at a high frequency and worsening of headache on discontinuation of medication. Over several months, frequency and duration increases such that attacks become daily or near daily, although not necessarily more severe. Opioids and barbiturate-containing analgesics most commonly produce this syndrome. - Sphenoid sinusitis: Vertex or frontal pain, often described as pressure, but not necessarily with additional sinus symptoms. - Giant cell arteritis: Generally over 50 years of age. New head pain associated with soreness of the scalp; polymyalgia rheumatica and often jaw or tongue claudication. - Temporomandibular disorder (TMD): Pain over temporalis associated with noise and clicking over TMJ with jaw movement. Often associated with bruxism and limited jaw movements, or pain or locking of the jaw with opening of mouth. - Pituitary tumor: Abnormal neurologic examination. Visual field defects and galactorrhea may occur. - Brain tumor: Abnormal neurologic examination including reflex asymmetry, sensory asymmetry, or motor weakness. Papilledema suggests an intracranial mass lesion. - Chronic subdural hematoma: Abnormal mentation, abnormal neurologic examination including reflex asymmetry, sensory asymmetry, or motor weakness. - Pseudotumor cerebri (idiopathic intracranial hypertension): As well as papilledema, there may be reduced visual acuity, visual field defect (enlarged blind spot), or diplopia caused by a sixth nerve palsy. CSF pressures are abnormal and are increased to >200 mm water in nonobese and >250 mm water in obese people. 5. Not better accounted for by another ICHD-3 diagnosis. After appropriately diagnosing TTHs, medical professionals must then determine what the most effective treatment is for these headaches. Due to the lack of knowledge of concerning the etiology of TTHs, they are very difficult to treat. Medical professionals try to incorporate patient education, lifestyle modifications, and cost-effective medications into their treatments.11 An example of a lifestyle modification would be discussing smoking cessation with one’s patient. There is a strong positive correlation between how many cigarettes are smoked and how many days out of the week patients experience headaches. Research has also found a positive correlation between high volumes of nicotine and higher anger, anxiety, and depression. Although drug therapy is finite in its ability to treat the underlying cause of TTHs, it has still been found to be effective in relieving symptoms of pain many patients. To use acupuncture as pain relief in TTH, Linde K. et al reviewed 11 trails. The authors concluded that acupuncture could be a valuable non-pharmacological tool in patients with frequent episodes or chronic tension-type headaches. The use of spinal manipulations is quite controversial, especially when performed in the neck because of the reported adverse reaction and patients’ concerns about safety. The adverse reaction range from minor conditions such as stiffness and limitation in motion to more severe kind like permanent neurological deficits or dissection of vertebral arteries. A recent study of Castien et al reported that manual therapy is more effective than usual general practice care in reducing symptoms of chronic tension type headache. This practice care includes posture corrections and maintaining these. These corrections mostly apply in the frontal plane. Other studies demonstrate the fact that spinal manipulations were effective for tension type headache included patients with the chronic condition. Therefore, spinal joint manipulation may be more effective in chronic than in episodic tension type headache. Despite all the positive findings, evidence-based guidelines recommend the application of spinal manipulations for migraine and cervicogenic headache, but not for tension type headache. These inconsistency results in non-appropriate treatment of patients.